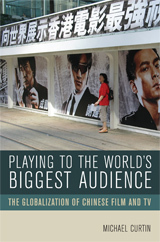 In this provocative analysis of screen industries in China, Hong Kong, Taiwan, and Singapore, Michael Curtin delineates the globalizing pressures and opportunities that since the 1980s have dramatically transformed the terrain of Chinese film and television, including the end of the cold war, the rise of the World Trade Organization, the escalation of democracy movements, and the emergence of an East Asian youth culture. Reaching beyond national frameworks, Curtin examines the prospect of a global Chinese audience that will include more viewers than in the United States and Europe combined. He draws on in-depth interviews with a diverse array of media executives plus a wealth of historical material to argue that this vast and increasingly wealthy market is likely to shake the very foundations of Hollywood’s century-long hegemony. Playing to the World’s Biggest Audience profiles the leading Chinese commercial studios and telecasters, and delves into the operations of Western conglomerates extending their reach into Asia. Advancing a dynamic and integrative theory of media capital, this innovative book explains the histories and strategies of screen enterprises that aim to become central players in the Global China market and offers an alternative perspective to recent debates about cultural globalization. Michael Curtin is Professor of Communication Arts and Director of Global Studies at the University of Wisconsin, Madison. He is also the author of Media Capital: The Cultural Geography of Globalization and Redeeming the Wasteland: Television Documentary and Cold War Politics.